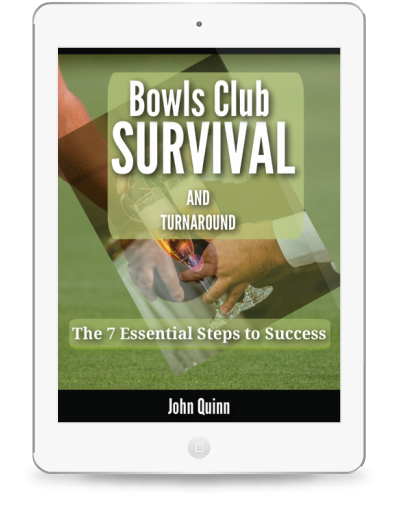 I am chairman of a Bowling Club that has risen from the ashes and I thought your other readers might like to hear how we did it! Four years ago we reached the dreaded October with no money (not a penny) and 30 members. The club opened every Friday evening for a ‘social evening’……but this was frequented by half a dozen regulars for a drink and a chat ie. not very useful! I took over as Chairman, because nobody else would, since then I have had carte blanche over club affairs. Next to our club is the local Leisure Centre with two indoor rinks. We started evening roll ups indoors followed by quizzes/ bingo in our club during the winter. In the summer we have roll ups outdoors every Friday tied to a competition with the best 8 scores counting followed by the inevitable quizzes and other entertainments. This format has lifted our turnover to some £15,000 over the last two years. As an aside we had all our machinery stolen in that dreaded October 4 years ago due to a very insecure and neglected Machine Building. With the insurance claim and our new found turnover we have spent some £25,000 over the last 3 years on everything the club needs. Without warning the indoor rinks have been closed this year which threatens attendance during our winter period. Our answer to this is to supplement our winter entertainment with professional acts every 3 weeks or so. (Single singers/comedians/magicians etc at an average cost of £150). The extra cost of this will be offset with an entry fee of £2 or £3 per member….we expect between 40 and 50 members each Friday. We can only accommodate this number comfortably. Currently the membership is well over 70 and still rising. We have a much higher local profile and make use of all the local organisations to our own ends. Finally, honest!, due to all the above our success on the green has seen 2 unprecedented years. I feel as though I have taken your advice without knowing it which is a little spooky!! Good Luck with the website, I will certainly stick around for the foreseeable future. If anyone else has a story to share please get in touch.